This is a morality tale for those who have or intend to purchase a wood-burning stove to help bring down their energy bills, and those who are crafting home grown gifts for family and friends. If, like us, you fall into both categories beware the hidden dangers. On Friday, I decided to light our relatively new wood-burning stove ( a very high tech model the Burley Debdale) whilst dh Terry was hunter-gathering provisions for our supper (pizzas from Tesco). I cleared out the ashes from the previous day and put them in the peely bin. Some were still glowing a little so I decided to empty the peely bin in the very large compost bin at the bottom of the garden. Ten minutes later, I glanced out of the window, and saw a minor towering inferno. I investigated and discovered that one of our three 700l plastic compost bins was blazing away. I was a little surprised by the combustible nature of our compost but duly fetched the hose and deluged the blaze with water. It took some time before the flames and smoke were eliminated. I was shaken! When Terry returned, I confessed the results of my ash-disposal. He was able to add some background. Earlier in the day, whilst starting to clear out the garage, He decided to dispose of our failed attempt at Peaches in brandy. This was 2 jars – with approximately one pint of brandy and 8-10 peaches and he put them on the compost heap. 1. 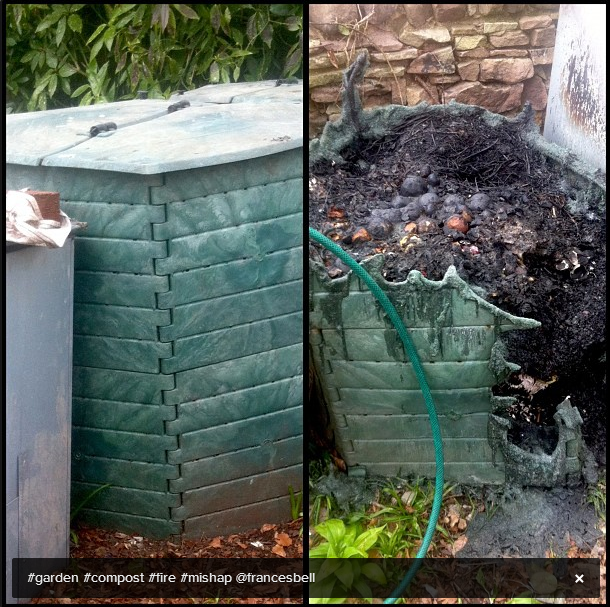 Glowing ashes + brandy-soaked compost = conflagration. 2. We need to invest in an ash carrier so we can safely cool our ashes before disposing of them.